Need pictures? Click on "Go to related images" at the bottom of this page. Others are available upon request. One part of the exhibit explores how scientists have employed pinhole photography, including several examples from Los Alamos National Laboratory: Julian Mack’s 1945 pinhole exposure of the first atomic bomb test in New Mexico and Richard Blake’s 1960 X-ray photo of the sun. Other photos reveal ethereal takes on world events: Chris Dreier’s 2010 image of the remnants of Nicolae Ceașescu’s Romanian Palace; Marcus Kaiser’s 1990 images taken through holes in the collapsing Berlin Wall; Harlan Wallach’s 1994 series on murder sites in Chicago. 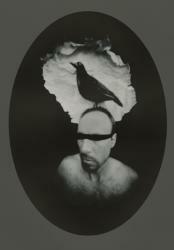 Sunday, April 27, 1–4 pm: Poetics of Light: Pinhole Photography, exhibit opening. Be among the first to see the stunning images and enjoy a lecture by guest curators Nancy Spencer and Eric Renner, "Passion, Light and Pinhole Photography," at 1 pm in the History Museum auditorium. Reception 2–4 pm, along with a book signing for Poetics of Light: Contemporary Pinhole Photography (Museum of New Mexico Press, 2014). As an extra treat, the Palace Press will release its latest letterpress broadside, Jane Always Dreaded Flying Home, featuring a digitally printed pinhole photo by Gregg Kemp and the poem it inspired by Santa Fe Poet Laureate Jon Davis. April 27 is Worldwide Pinhole Photography Day, and you can watch as images are added to www.pinholeday.com. Refreshments courtesy of the Women’s Board of the Museum of New Mexico Foundation. Events free with admission; Sundays free to NM residents. Santa Fe Poet Laureate Jon Davis hosts the fifth of six readings he has organized in and around Santa Fe. Featured poets: Chee Brossy, Joan Logghe, Carol Moldaw, Henry Shukman, and Farren Stanley. In the museum auditorium. Free. Join Santa Fe Poet Laureate Jon Davis for a writing workshop based on Poetics of Light: Pinhole Photography. Open to high schoolers and older, the session brings participants into the Herzstein Gallery to study pinhole photographs and inhabit them imaginatively. Let language carry you toward and away from the images. Draft poems that engage what’s in front of you—and explore what is only suggested by these often mysterious photographs. Free; make a reservation by calling 505-476-5096. Join Photo Archivist Daniel Kosharek for a Free First Friday Curator Talk in the exhibition gallery. Pennsylvania-based photographer Scott McMahon speaks about his exploration of pinhole photography, his interest in the ephemeral nature of things, and how building subject-specific cameras helped him link two-dimensional images with sculpture and installation. In the museum auditorium. Free with admission. Join Santa Fe educator, photographer and camera obscura developer Jackie Mathey for a family workshop on building tabletop camera obscuras that can be used as drawing aids. Explore how light moves and images are formed. Travel in your imagination to the age of the Renaissance where devices like these were used by artists. In the museum classroom. It’s free, but class size is limited; make a reservation by calling 505-476-5087. California pinhole artist Peggy Ann Jones speaks on how the creative potential of photography expands when the artist designs and constructs the camera. Basic concepts of the photographic process led Jones, an associate professor at MiraCosta College in Oceanside, Calif., to visually comment on principles of photography and traditionally accepted modes of photographic production. Her photos and cameras are included in Poetics of Light: Pinhole Photography. In the museum auditorium. Free. Los Alamos National Laboratory fellow and astrophysicist Ed Fenimore speaks about his work on a complex pinhole-based camera that flew on a 1991 Space Shuttle experiment. Why pinhole? Some stars and especially black holes generate mostly x-rays, but x-rays reflect and refract poorly. The best imaging technique for such stars is the technologically simplistic pinhole. LANL developed a coded array with 22,805 pinholes to get the task done. In the museum auditorium. Free with admission; Sundays free to NM residents. Bring an empty coffee can, oatmeal box, potato chip can or shoebox (with lids), and we will provide the rest. Make your own camera obscura. See the world through a pinhole of light. A drop-in, family-friendly event suitable for all ages. In the museum classroom. Free with admission; Sundays free to NM residents.